Once again we are teaming up with the fabulous BBSA (British Bridalwear Suppliers Association) for their sample sale – but this time BOA Boutique is making it even more special, and we could not be more excited about it. Designers included in the sale are Charlotte Balbier, Ivory & Co, Anoushka G, Sadoni, Sheila Harding London and many more. This is unprecedented here at BOA Boutique as some of the gowns would have originally retailed for over £3000. 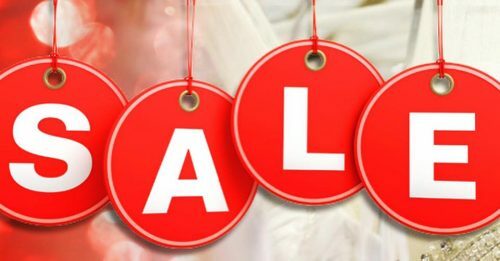 There are no exceptions, if the wedding dress of your dreams is in the sample sale – it will cost you £500. Obviously, some may require dry cleaning (they have never been worn but will of course have been tried on, and this charge is payable by the buyer) and similarly, if you require us to do your alterations for you, then there will of course be our standard alteration fees, but you can take your dress away with you immediately if you wish to arrange to have your alterations elsewhere. This really is an incredible, one off offer – BOA have certainly never had a sale like this before, so obviously we expect demand will be high, and will be strictly by appointment only. We only have one style of each dress so appointments can be made by email or by telephoning us directly.